Below is the press release about Billy and a brief synopsis of his career. We had the fortune of having Billy visit Forest Greens in 2010 the day we hosted the annual First Tee Tournament. Billy was his usual generous self that day, greeting all of our players when they arrived. He drove around the course shaking hands, posing for pictures with everyone, and spent time talking with anyone that walked up. The Grill Staff served Billy a buffalo burger for lunch which he gratefully enjoyed. It was a day we will never forget. Billy Casper, one of the most prolific winners on the PGA Tour who was overshadowed at the height of his career by the "Big Three," died of a heart attack Saturday at his home in Utah. He was 83. Bob Casper said his father died quickly and peacefully with wife, Shirley, at his bedside. They had been married 62 years. Casper passed out in the clubhouse at the Masters last year, had work on his heart and recovered from a bout of pneumonia over Thanksgiving that kept him hospitalized for a month. His son said Casper was going to cardio rehab for the last four months and was doing well until he started to feel badly in the last week. In any other era, Casper might have commanded more attention than he did. "I think it is fair to say that Billy was probably underrated by those who didn't play against him," Jack Nicklaus said Saturday night. "Those who did compete against him knew how special he was." Casper won 51 times on the PGA Tour, putting him at No. 7 on the career list behind only Sam Snead, Tiger Woods, Nicklaus, Ben Hogan, Arnold Palmer and Byron Nelson. His three major championships include the 1966 U.S. Open, one of golf's most remarkable comebacks. He rallied from a seven-shot deficit on the back nine at Olympic Club to tie Palmer, and beat him in an 18-hole playoff. Casper also won the 1959 U.S. Open at Winged Foot and the 1970 Masters. He was inducted into the Hall of Fame in 1978. He was overshadowed by the "Big Three" -- Palmer, Nicklaus and Gary Player, whose rivalry sparked a revival in golf in that era. Part of that was the marketing of Mark McCormack at IMG. Casper originally signed with IMG and then left. From 1962 through 1970, Casper and Nicklaus won 33 times on the PGA Tour, while Palmer won 30 times. According to Golf Digest, Casper's winning rate of 9.2 percent trails only Nicklaus (12 percent) and Woods (26 percent) of all golfers who started after 1950. Casper was a genius with the short game, considered one of the best putters in golf. When he won the U.S. Open at Winged Foot, he purposely laid up on the par-3 third hole all four rounds and got up-and-down for par each day. "Billy was a fantastic player, and I don't think he gets enough credit for being one," Nicklaus said Saturday night. "I have said many times that during my career, when I looked up at a leaderboard, I wasn't just looking to see where a Palmer or a Player or a (Lee) Trevino was. I was also checking to see where Billy Casper was. Billy had tremendous confidence. He just believed in himself. "You knew when you played against Billy Casper, Billy would not beat himself." Casper won his first PGA Tour event in the 1956 LaBatt Open over Jimmy Demaret, and Casper won at least once each season for 16 straight years, a streak only surpassed by Nicklaus and Palmer at 17. 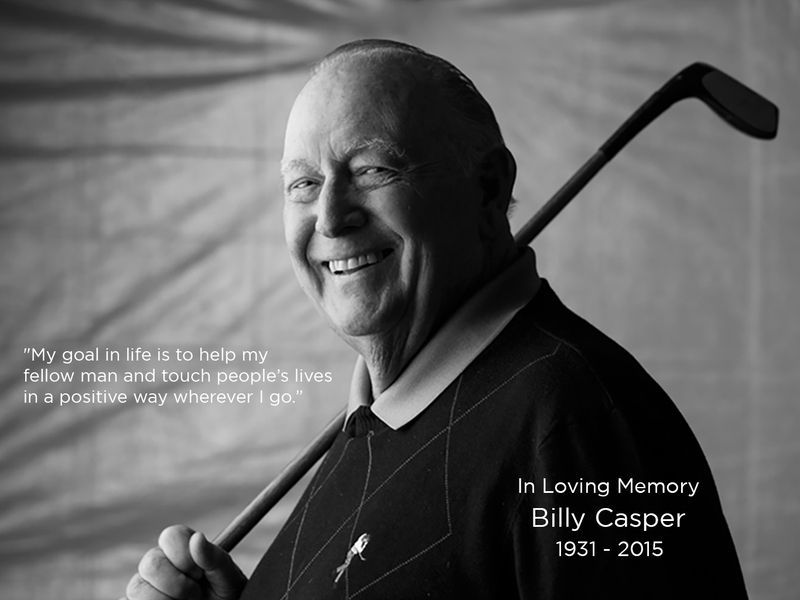 More than golf, Casper was devoted to family. He had 11 children, six of them adopted, and he is survived by 71 grandchildren and great grandchildren. He became a Mormon just as his career was taking off. "We lost a true friend tonight." In 1992, Casper founded the Billy Casper Youth Foundation and for more than 20 years hosted an annual charity event in San Diego that raised more than $3 million for children. Casper was born June 24, 1931, in San Diego and began to caddie at San Diego Country Club. He was among the first of the great lineage of golfers in San Diego that included Gene Littler and Mickey Wright. "Gene was so much better than me. I never beat him as a teenager," Casper told Golf Digest in a 2012 interview. "But I had a lot of inner confidence. I had such a tie with my eyes and my hands. I could look at a telephone pole 40 yards away, take out a 7-iron and hit it 10 times in a row. I had something special. And somehow, I really understood the game, all without having a lot of guidance." Casper won the PGA Tour money title twice and was player of the year in 1966 and 1970. He won the Vardon Trophy for the lowest scoring average five times and still holds the American record in the Ryder Cup for most points. He played on eight teams and was the winning captain in 1969.